Temple Grandin did not talk until she was nearly four years old, but tickets to her speech Sunday at Emory's Schwartz Center for the Performing Arts were sold out almost three weeks before the event. This fact is just one small testament to the inspiring trajectory of Grandin's life. Now an internationally known advocate for people with autism and expert in the field of animal science, she received an honorary doctor of letters degree during Emory's 171st Commencement. 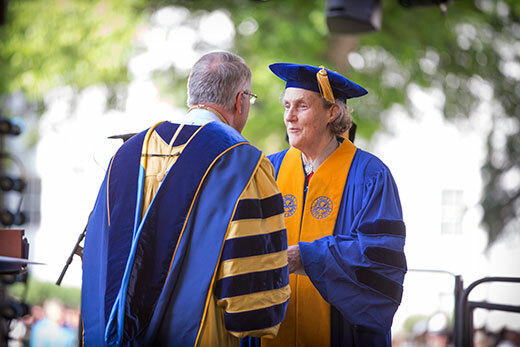 "Scientist, author and advocate, gifted in ways beyond the ken of most of us, you saw a path where others might see hopelessness," Emory President James Wagner told Grandin on May 9 as he conferred her degree, one of the two highest honors given by the University. "Through keen awareness, creative vision and moral imagination, you improve human life and you relieve the fear and suffering of animals." The day before, it was Grandin's turn to speak, and her public lecture on "Helping Different Kinds of Minds Solve Problems" drew a capacity crowd. It's a topic for which Grandin can, and did, serve as the prime example. When she was diagnosed with autism in 1950, her mother was advised to put her in an institution. Now she is a professor of animal science at Colorado State University and a sought-after consultant to the livestock industry on animal behavior. Grandin is also an advocate for people on the autism spectrum and the author of several books on the subject. In the 2010 Time 100, an annual list of the 100 most influential people in the world, she was named in the "Heroes" category; an HBO film about her starred Claire Danes. Addressing the rapt audience, Grandin credited her mother for setting her on the road to success. "When I was a little kid, I was nonverbal and fortunately I had a mother that always pushed me," Grandin said. "She got me a great early intervention, and a '50s upbringing helped — teaching table manners, teaching me how to take turns." Also crucial, she continued, was how her mother helped her with "learning how to work" by getting her a sewing job at age 13 and a job cleaning horse stalls at 15, followed by jobs painting signs. As she got older and her career interests focused on animal science, many of her early jobs were on construction sites. "I learned a lot from working in construction. You've got to get the job done," Grandin said. "And I want to see kids like me be successful." Clad in her trademark Western wear, Grandin spoke for almost an hour before taking questions from the audience. She focused her discussion on different kinds of thinkers and how each can excel in the workforce and life, with plenty of examples drawn from her own experiences. Photo-realistic visual thinkers, like herself: "I don't think in words. Everything I think about is a picture." Pattern thinkers: "This is your mathematician. They don't think in pictures. They think in patterns. Think origami. Think organic chemistry." Verbal fact thinkers: "This person knows everything about his favorite subject. And some of these kids get hung up on their favorite stuff." "When you realize that different people have different ways of approaching problems, then they can work together," she said. As a visual thinker, Grandin explained that she perceives everything in pictures rather than words. She gave an example of hearing the word "steeple." Rather than associating it with an abstract idea, "my concept of a steeple is made out of specific examples," she said. "And then I sort them into cathedral types, New England types, chapel types … and the more steeples I see, the more elaborate my concept can be." Too often, Grandin said, people try to force everyone to think in the same way; those who don't are labeled as "abnormal." "When you get a label – autism, dyslexia, ADHD — the kids tend to be good at one thing but bad at something else," she said. "Another problem we've got with the autism label is you're going all the way from someone who ought to be working in Silicon Valley … to someone who can't dress themselves. "It all has the same name and I'm seeing too many people get hung up on the label." Grandin explained that her different style of thinking makes it difficult for her to do algebra — an abstract math that she argued should not be considered a gateway to other courses, hindering the academic achievement and thus employability of many people on the autism spectrum. But her "different kind of mind" gifted her with the ability to visualize and design livestock facilities from the perspective of the animals, understanding how what they see — anything from a dangling chain to a man walking when they are accustomed to people on horseback — could spook them and make the process both less efficient and less humane. "Other people weren't noticing that these little details were distracting them," she said. With self-deprecating humor, Grandin explained how people who might be perceived as "weird" can still find success in the workforce, starting with letting their work speak for them. One of her early jobs was painting signs, so to get more jobs, she showed photos of her previous work. As her career as an animal behavior expert grew, she created a brochure to advertise her services for designing animal facilities. "When you're weird, you sell your work," she said. "When you go for an interview, you just put your work out there and show them. And now it is going to be on an iPad, so you better make sure it is charged." Throughout her lecture, Grandin encouraged parents of children with autism to acknowledge the different ways that they think and the needs these differences create, while also "stretching" them to expand their horizons and abilities. For younger children, she demonstrated how an interest in trains might be stretched to encompass other areas: "If he likes trains, then broaden it. Let's learn how a train works. Let's learn the science of it. Let's look at where trains travel. Let's study some of the destinations that trains go to," she said. "By making an associative link back to trains, you broaden it." For older children and young adults, she advised parents not to allow them to retreat into their rooms to play video games, but to look for ways to redirect their passions toward areas that could lead to employment. An interest in computer games could lead to learning coding, or the person's thinking style might be just right for a hands-on job like being a welder or mechanic, careers Grandin argued are critical to our economy. "We need to be working on slow transitions from the world of school to the world of work. I can't emphasize that enough. Sudden transitions are bad," she said. "What you've got to do with these kids is you've got to stretch them. Don't throw them in the deep end of the pool, no sudden surprises, but if you don't stretch, they don't develop." And it's not only people with autism who can benefit from "stretching." Grandin also spoke more broadly about the "lack of depth" she sees across today's society. "One big concern I have today is that young people are not reading deeply enough about any issue that they are interested in," she said. She used air travel as a case in point. In the past, people read newspapers on planes, she said. Now when she flies, she is the only one with a newspaper, while most other people have smartphones. "One of the things all of these apps have done is make people get worse in their silos," Grandin said, noting that a benefit of reading a newspaper is that you encounter articles and topics that you might not otherwise seek out. "I'm worried about things getting too narrow," she said. "We have got to work on tearing these silos down."